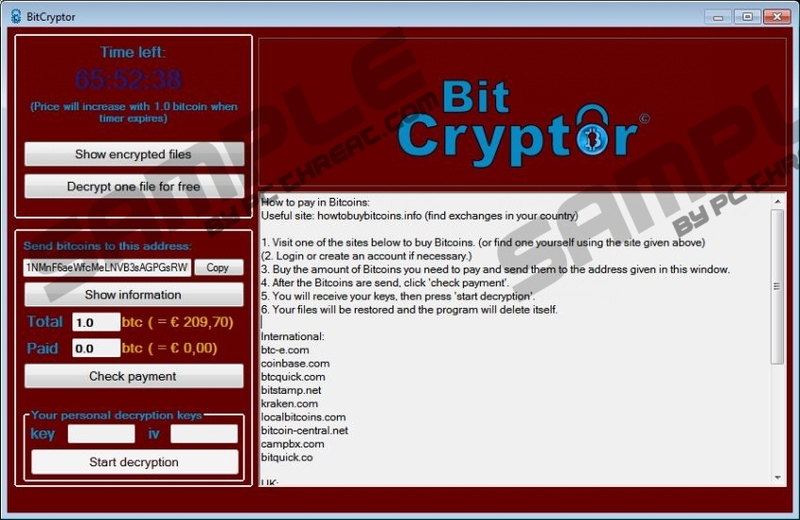 Bitcryptor Virus is a ransomware infection that might enter your system anytime. It is more likely that this will happen if your PC is unprotected and you surf the Internet on a daily basis. Bitcryptor Virus acts like CoinVault ransomware; thus, it is not surprising that it will encrypt your major files and will not allow you to access different programs. If you have already noticed that you cannot access your files and programs, and your wallpaper has been changed, there is basically no doubt that you have encountered Bitcryptor Virus. Our specialists say that it is very difficult to get rid of Bitcryptor Virus because it blocks system utilities (e.g. Task Manager) as well. Luckily, we know what you should do in order to delete Bitcryptor Virus from the system. Continue reading this article to find out how to do that. Bitcryptor Virus is the infection that seeks to extort money from computer users; thus, it encrypts various files, including text files and pictures, and then asks to pay 1 Bitcoin (1btc = €209, 70). Of course, the sum might change depending on the situation; however, we still do not think that you should pay money to cyber criminals. We do not think that you should do that because it is very likely that you will not even receive the key for the decryption of your files. In addition, it is not worth contributing to the activities of cyber criminals. Do not worry; you will be able to restore your files from a backup even if you do not pay money to the creator of Bitcryptor Virus. In order to do that, you have to get rid of Bitcryptor Virus first. Research has shown that the majority computer users infect their systems with Bitcryptor Virus when they open a spam email attachment. We recommend ignoring spam emails in order not to infect the system with malware. In addition, you should always keep your Windows up-to-date and do not forget to install a security tool. There are many untrustworthy security tools on the web, but we still think that SpyHunter is the best choice because it can prevent different undesirable programs from entering the system. It is impossible to remove Bitcryptor Virus manually. Luckily, an antimalware tool, such as SpyHunter, will be able to do that for you; however, it is not so easy to install it on the system. In order to acquire this security software, you will have to start Windows in Safe Mode with Networking. You will find our manual removal instructions that will help you to download the security tool. After downloading it, you have to perform a scan and a ransomware infection will disappear. Restart your computer and start tapping F8 immediately. Select Safe Mode with Networking using arrows keys. Press Enter. Select the Startup tab and click Disable All. Install the security tool and scan your system. Keep tapping F8 when BIOS screen disappears. Install it on the system and scan your PC. Click on the Power button (it is placed at the Windows login screen or the Settings charm). Download and install the security tool. Quick & tested solution for Bitcryptor Virus removal.